When your 2.5 year old asks repeatedly to go for a hike, but you're too sick? Not the best feeling. The Little Man developed hand, foot, and mouth disease for the second time recently which kept us inside and taking it easy last weekend. This past Wednesday afternoon the virus hit me like a Mack truck. First one of the worst fevers I've ever had, then the blisters covered my throat. 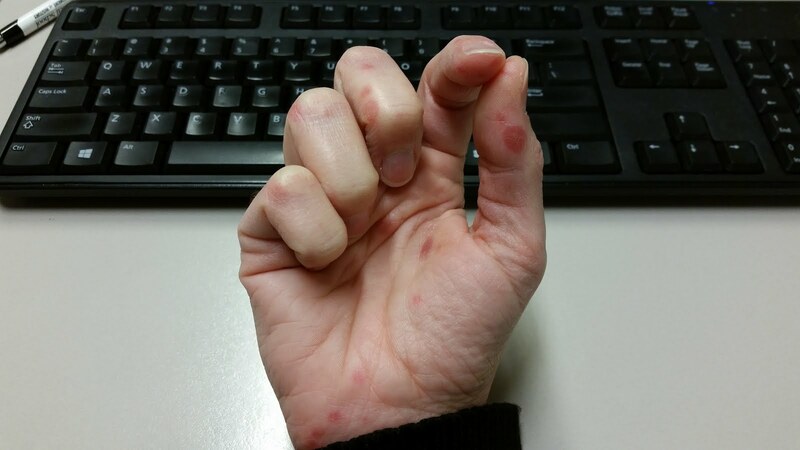 When the fever abated, the blisters started popping out on my hands. And now they're on my feet too. So no hiking this past weekend. And not much of anything at all. I'm wearing my Uggs to work today because they're the softest shoes I own. Business casual be damned. I keep trying to think of ways to describe how the blisters feel. They don't itch. They hurt. Each one feels like there's a needle or thorn stuck in it. Like if your hand falls asleep and you grab something, only worse. Simple things like opening food packages or wringing out a washcloth are extremely unpleasant. Last night after my shower I could barely walk. I can only assume the hot water has a negative effect on the blisters. Fortunately, I was able to walk again this morning. But I will not be showering again any time soon. Ibuprofen seems to help take the edge off. Trying to hold my hand to show as many blisters as possible. Only partially successful. Horrors, I am so sorry! I got one blister and got all paranoid! but it may be a coincidence, that haven't been any more. And it wasn't painful--but very random.